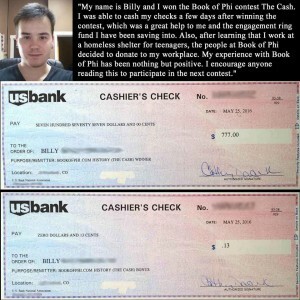 Congratulations goes out to Billy for winning the Book of Phi – History Cash! Book of Phi – History Has Arrived. . .. Along with another chance to Win! Check out the 7 pictures and 7 pages that comprise the Book of Phi – History (Chapter 1) on www.bookofphi.com. If you’re clever, you may be the one to win The Cash ($777 & $0.13) or The Gold (0.1oz American Eagle gold bullion coin). Hmmm. . .. why $0.13? Jennifer, a math teacher from Missouri, was the first to solve The Kairos Challenge and Win $777. Congratulations to her! Maybe you will be the next winner.